Advanced English Dictionary is a new way to discover meaning. With more than 4.9 million words, phrases, and definitions, including a wealth of new words, sample sentences, and usage notes, Advanced English Dictionary makes it easier than ever before to find the correct meaning of a word. Available for the iPhone and iPad. Advanced English Dictionary is distinguished from the other (paper, electronic) dictionaries in many ways. Not because it contains far more words than a conventional paper dictionary, but because it uses a radically new approach and technology called WordNet. Instead of just listing the words and their definitions, Advanced English Dictionary shows how every word is linked to another. Type in the word "tree" and you will get not only the definition, synonyms and opposites, but the hypernyms (a tree is a kind of what? ), meronyms (what are the parts of a tree?) and more. You can also find a list of hundreds of trees, from yellowwood to the Tree of Knowledge, and even all words that contain the letters t-r-e-e. This WordNet approach will help you to understand the meanings of words better. Linguists call WordNet project one of the biggest leaps for dictionaries since scholars sat down to write the epic Oxford English Dictionary. Advanced English Dictionary uses one of the largest English dictionary databases. It includes up to 591,700 entries and more than 4.9 million words (both American and British English). No internet connection required to search words - everything is stored on your device and available anytime, anywhere in the world. 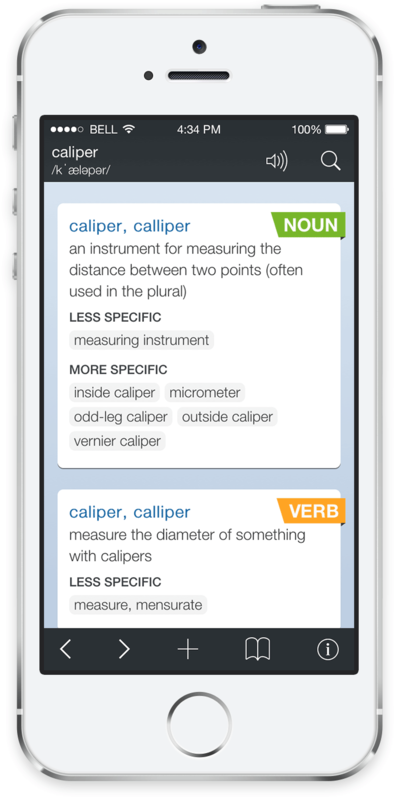 Advanced English Dictionary includes high-quality audio pronunciations (available in American, British and Australian English, in both male and female voices). More than 335,000 semantic relations between definitions. Advanced English Dictionary shows how every word is linked to another. Sample sentences show you how to use the words in your own speaking and writing. Advanced English Dictionary includes a unique conceptual thesaurus with word links. Includes biographical and geographical data, technical and scientific terms, idioms, prepositions, conjunctions, determiners, interjections, abbreviations, contractions, common misspellings, irregular forms and even Old English words. Clear and precise definitions. You can use them as reference. The content was developed by the Cognitive Science Laboratory at Princeton University. Advanced English Dictionary incorporated a powerful, web browser like user-interface on which you can efficiently reach what you are mostly interested in. You won’t need to wade through manuals before you start. Copyright © 2019 jDictionary Mobile. All rights reserved.